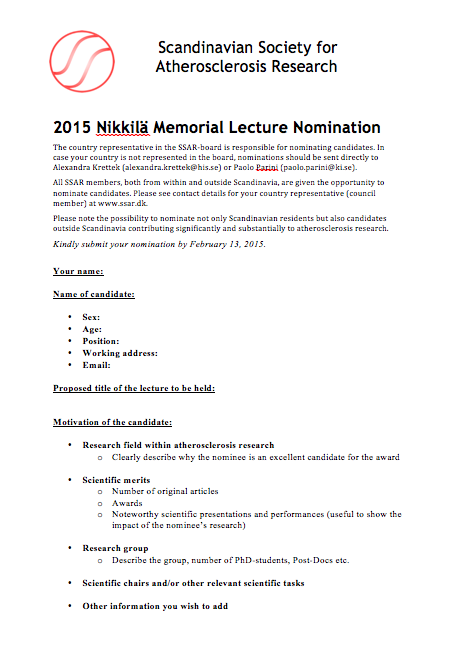 The country representative in the SSAR-board is responsible for nominating candidates. In case your country is not represented in the board, nominations should be sent directly to Katariina Öörni or the Chairman of the Society . All SSAR members, both from within and outside Scandinavia, are given the opportunity to nominate candidates. Please note the possibility to nominate not only Scandinavian residents but also candidates outside Scandinavia contributing significantly and substantially to atherosclerosis research. Looking forward to receiving your nominations!